Sara Boutine is a passionate actress who found a deep and organic connection to yoga. Sara began her fitness journey about 6 years ago; starting with Pilates, Hiking, Running and eventually fell in love with Yoga. Following her heart and gut she joined Teacher Training in September 2013 and has been teaching ever since; beginner classes, intermediate flows, yoga sculpt, restorative yoga and Bootcamps geared towards yoga practice. This year Sara started her own company YOGIBANDITS dedicated to Yoga in the corporate world, from law firms to IT Companies. The goal is to share and make yoga possible everywhere and to everyone. I’ve been practicing yoga for many years and in that time I’ve had the opportunity to experience many different styles, studios, and guides. I believe there’s always something to learn in any yoga class but I also know the joy of finding yourself in the hands of a well practiced and loving yoga teacher. Sara Boutine is that teacher. When I step into her classes I feel genuinely cared, she instructs in an organic and specific way and offers impactful adjustments. Her intuition and awareness for the room and her students makes her teaching style seem effortless but that ease comes from her sincere dedication to teaching. Every time I see or work with Sara, I feel it in my heart. She has the gift of big loving magic and she expresses it through yoga. Her teaching style is warm, present, compassionate, and giving. We think of yoga often in terms of balancing the body and mind, but it is also a moving meditation for the soul. 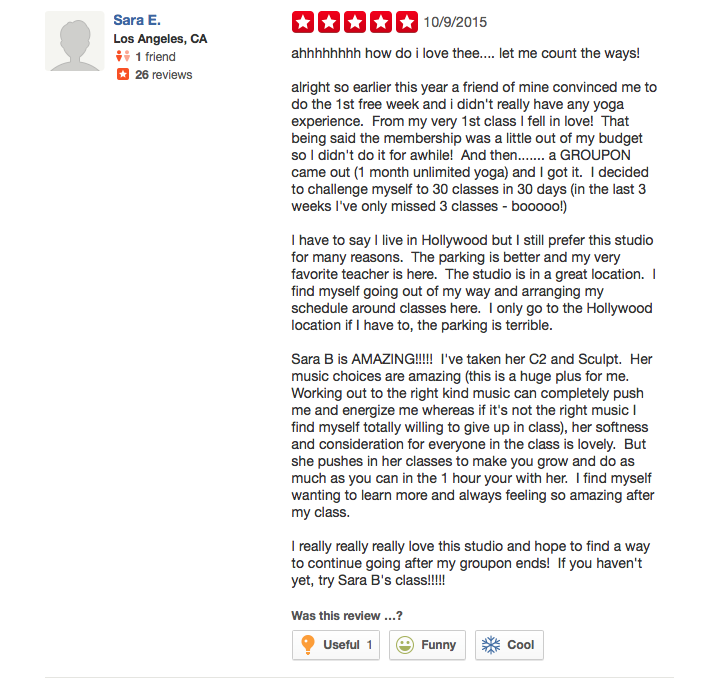 Sara teaches her classes with so much heart and soul… and yes her sculpt classes will make your body look bangin. Namaste. 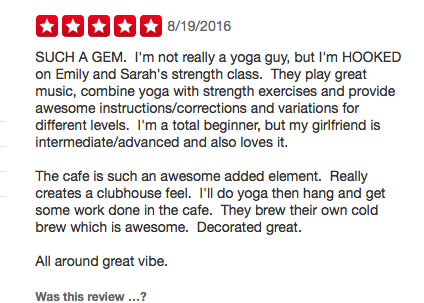 Sara is the true embodiment of yoga. Her words, actions, poses, and disposition bring students, community, and hearts together in union just as yoga is meant to do. Sara leads challenging classes with confident and easy to follow instruction; gently encouraging and empowering students to find their edge. Her foundational approach and modification offers make class approachable for everyone. Sara is always available on and off the mat to guide and support students in their practice, no matter where they are. She is magnetic and inspiring; gaining herself an extensive and dedicated yoga following in the community. Sara is a delight to learn from and know and my yoga practice has deepened and strengthened under her thoughtful leadership. Sara is a real gem of a teacher. She always knows exactly what to say to push you! She molds her classes to be an open space for her students to learn and grow together. Her warm and loving energy sets you at ease and allows you to fully let go into your practice. I'm so lucky to have had Sara's influence on and off my mat! I absolutely love working out with Sara, I schedule my workouts around her schedule as much as I can. She is super sweet, has amazing energy and knows exactly how to keep one engaged in the workout. Her routine is simple, yet works every muscle. After I am done taking her class, my body feels super toned, especially my abs because she really focuses on the abs. Love, love, love Sara. Sara Boutine is an amazing teacher. She is calm and assertive. She really knows her stuff and she guides you through a creative, fun, class with a wonderful voice to follow. She brightens the room when she walks in and you will immediately fall in love with her. Her classes are great for all skill levels as she offers modifications for all yogis. Sara is definitely one of my most favorite teachers. I highly recommend her classes. Sara is Amazing. I've had the pleasure of watching her bloom into the great yogi she is today and I could tell you she never stops surprising me. I started taking yoga around the time she started teaching sculpt and I remember thinking her class was pretty easy. NOW if I don't watch my breathing I'll have to stop to catch it. I am an athlete and a martial artist. I've had privates with her and she is even more full of knowledge one on one. Definitely a great work out and stretch for people at all levels because she also gives modifications. Her music always rocks. And her work outs are the best. She's taught me and my body so much and I am grateful for the instructor that she is.